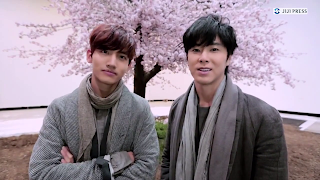 The Korean male Duo, TOHOSHINKI will release a new single, “Sakuramichi (Cherry blossom promenade)” to commemorate their 10 year's anniversary on February 25, and they just released its MV. It is a graduation song for those who take a brand new path in their career and they feel both excited and anxious. Departure is the theme of the MV. In the train scene, the message from TOHOSHINKI that Yunho and Changmin will continue to be bonded with their fans who have walked together with them until now is conveyed. CM: I think that this song is best suited to the spring of 2015. YH: Yes, Everyone, through watching this PV, please get strength/power from TOHOSHINKI, please live well.